This page will explain how to create a learning wrapper for your video. Learning wrappers allow you to "wrap" the video with learning support resources - such as self assessment quizzes, questions for reflection and discussion, additional links for deeper exploration, etc. Our learning wrapper template is mobile friendly and can be applied to any UBC CMS (Content Management System) Websites. To see the learning wrapper in practice, check it out on the Digital Tattoo website. Please note that this template is only tested on the newest UBC CMS template theme, so some of these features may not work well on the older UBC CMS websites. 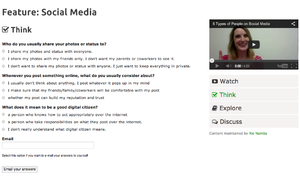 Watch - where you will be embedding your video, including YouTube and Kaltura videos. 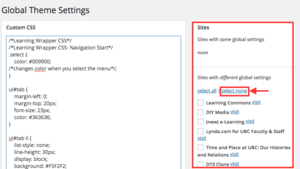 Explore - where you will be adding additional learning materials and any other external/internal links. Discuss - where you will be adding a discussion question. Since the wrapper is a customizable template, you can easily add or remove any of these components to suit your needs. For more information on how to customize, see Customizing the Learning Wrapper below. To add Quizzes on the Think page, make sure to activate Gravity Form plugin. For information on activating and using Gravity Forms, see the documentation here. 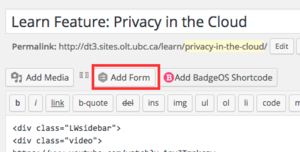 If you want to add comment section within the Discussion tab, contact http://support.cms.ubc.ca/ to activate Display Comments Shortcode plugin. 1. Create a new page. 4. Copy and Paste the following CSS to your Custom CSS. 6. Copy and paste the following HTML Code to your page. Make sure that you are on Text mode when you adding the following HTML. 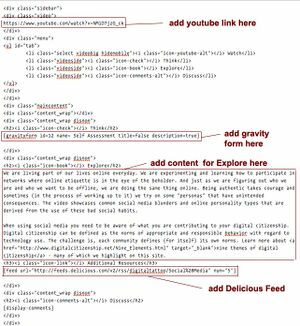 Click on the image on the right to see the color coded explanation of how the Learning Wrapper is used in the Digital Tattoo Webiste. Typically, when you are creating a content, you only need to manipulate the part highlighted in red. I will explain more in details below. 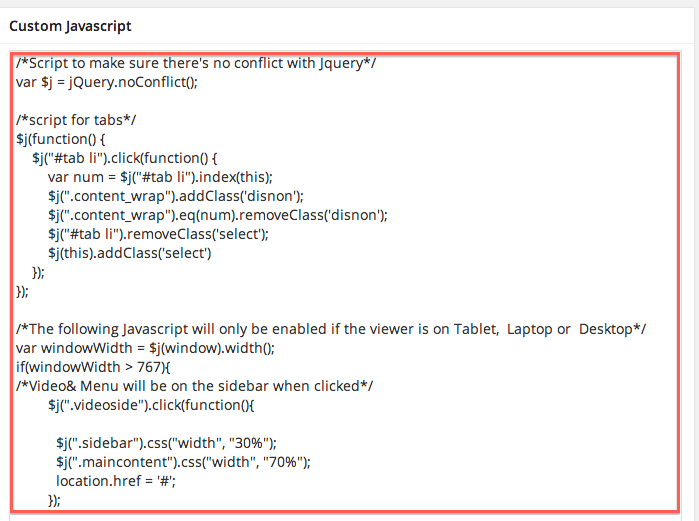 Copy and Paste the embed code of your video you want to add in between <div class="video"> and </div>. Make sure you are in the text (HTML) mode. On instruction on how to create a Gravity Form, see the documentation on Gravity Forms here. If you have activated the Display Comments shortcode plugin,and you would like to move the UBC CLF comment section inside the Discussion Learning Wrapper, add [display-comments] inbtween <h2><i class="icon-comments-alt"></i> Discuss</h2> and </div> . How do I change the color scheme of the Learning Wrapper? In order to change the color scheme, you will need to edit the CSS through Custom CSS. 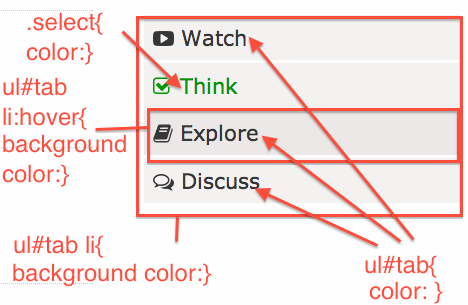 The picture on the left is a very brief diagram on where to make changes on CSS for each part of the color scheme. In order to edit the background color, edit the background in the CSS above. For example, if you want to change the background color of the menu to blue, change it to: background: blue; . Edit the color on the CSS above. For example if you want the text color to be red, change the CSS to color: red; . How do I change the icons that are used in the Learning Wrapper? See the instruction on how to add the icons here. What if I want to add more links to the menu?